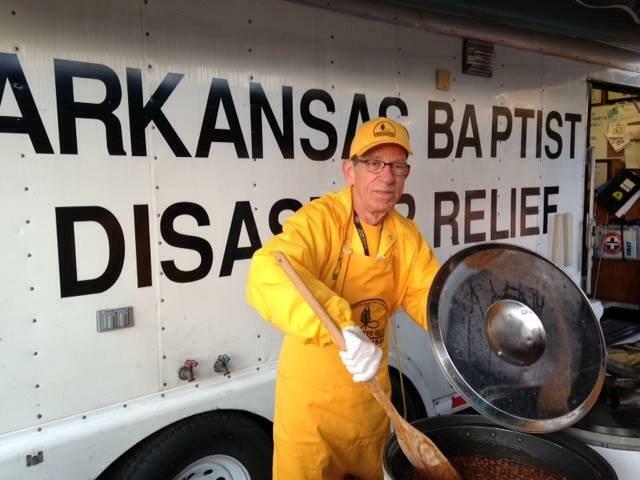 The purpose of this memo is to provide you with an update on what is going on with Red River Baptist Association Disaster Relief. We have now had an actual response using our new quick response trailer. In the last week of December I was asked by our Clark County Emergency Management Coordinator if we could support an operation involving search teams searching for a missing person in a wilderness area south of DeGray Lake. 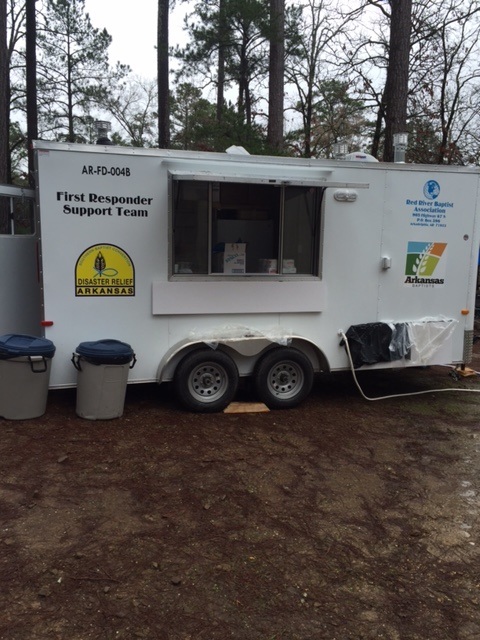 We set up at the DeGray Community fire station on December 31st and remained there through January 2nd. Thanks to David McAllister, Ed Whitson, and Bill Ratliff for working all 3 days and to Joe Burt for relieving me for a day. I am pleased to announce that we have a new blue cap. David McAllister of Arkadelphia and First Baptist Church recently received his training and recognition by the State Convention. David has been out with us on several events and had a major part in the construction of the quick response trailer. Our training session for 2017 is just a month away. The session that we will be hosting will be at First BC Hope on April 8th. If your ID badge is expired or will expire in 2017 you need to attend a session this year or you will not be allowed to respond. We also need those whose badges are current to attend to help move and set up the equipment, and to assist with the meal preparation. The only other dates for those in our area are FBC Fordyce on May 20th, and Geyer Springs FBC on October 14th. Please put these dates on your calendar now and share with others who may be interested in the ministry of Disaster Relief. This year the state convention will begin charging a minimal fee for the credentialing process. Updating volunteers applying for a new ID will pay $20 and will receive training materials, a background check, a Disaster Relief ID with lanyard, and lunch. New volunteers will pay $30 and will receive training materials, a background check, a Disaster Relief ID with lanyard, a Disaster Relief cap, and lunch. All volunteers applying for credentials (a Disaster Relief ID) will need to pre-register at www.absc.org/disasterrelief or arrive at 7:30 am to register and pay for credentialing. No fee will be charged current Disaster Relief volunteers who are NOT applying for an updated Disaster Relief ID but are attending training to further their knowledge in their chosen discipline, cross-train, assist with the training, or just catch up with other DR volunteers. If you are attending to assist with moving the equipment and/or preparing and serving lunch please let me know that you are by responding to this email. For those in the Arkadelphia area we will be have transportation in our bus and trucks departing the Red River Office at 7:00 am. If you will be riding with us please let me know. The Arkadelphia area volunteers will be out this coming weekend feeding about 100 search and rescue personnel attending a training workshop at Lake DeGray. This will be our fourth year to support this activity. I hope this helps you to stay informed and ready. Please call me at 870-246-5151 or e-mail me at johnsonhj@suddenlink.net if you have questions or comments.